The second day of road racing was an interesting mix of the long and short distances. Interesting because the schedule was modified slightly and this resulted in the 20k elimination races being held between the 500m semifinals and the 500m finals. Why does this matter, you may be thinking – surely the set of skaters who contest the 500m and 20,000m is mutually exclusive. 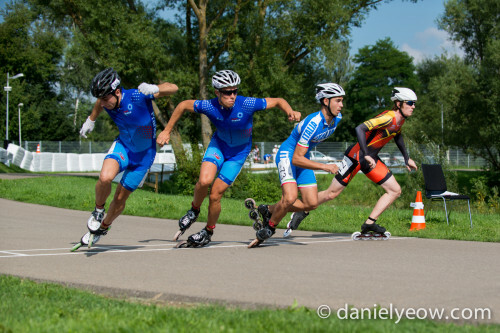 Surprisingly enough, is not that unusual for a skater in this sport to contest both the 500m and the 20,000m and it would be safe to say that skating 20,000m before a 500m race is likely to have a greater impact on the second race than doing a 500m race before a 20,000m. The early rounds of the 500m went mostly as expected. Although there were some funny combinations – like a junior ladies semifinal with three Italian skaters and one Hungarian, and a senior mens semifinal with three Dutchies and one Frenchie. The layout of the track also presented some difficulties with the right-turning ‘kink’ in the back straight offering opportunities to pass, but also offering opportunities for collisions. Unlike the uniform, symmetrical track with its super-narrow racing line, a road course like this one offers several different lines through the corners. Of course, these lines sometimes intersect and how the skaters deal with those intersections can sometimes be of concern. In the 20k, there can be as many as 40 starters, which makes for some interesting passing. In a race as long and crowded as a 20k elimination, there’s often far too much ‘scrapping’. In the photo above, you can clearly see many skaters ‘swimming’ through the pack with their arms (they’re not supposed to do that) and when there are 40 skaters racing at the same time, the officials can have a hard time giving out all the warnings that they should be giving. There were no very unexpected incidents although something that did stand out in my mind was early in the junior B mens race, one of the French skaters fell. Normally, this is the end of your race, because even if you get up quickly, you’ll be too far behind to catch the pack before the next elimination. Luckily (or unluckily) as he was getting up, another skater collided with him and went down. This allowed the French skater to get up and catch the pack before the next elimination (where the unlucky sod who tripped over him was eliminated). He was able to recover in the pack, shielded amongst his team mates, and actually went on to win the race. 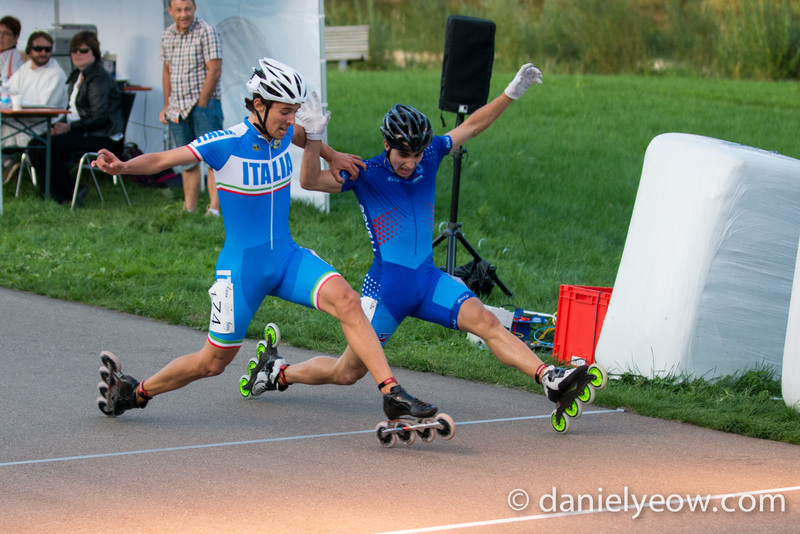 Also noteworthy in the elimination races was a very good refereeing decision in the junior A mens race, where Italian skater Stefano Mareschi crossed the line just in front of Raphael Planelles of France. However, it can be clearly seen (and thankfully was clearly seen by the judges) that the Italian had pulled back the Frenchman. About five minutes after the end of the race, it was announced that Stefano has been relegated to second place, giving Raphael the win. The 500m finals, which began at 10:15pm (which is why these updates always appear so late in the day) was mostly excitement, but also a little bit of controversy. In the junior A mens, the favourite going in was obviously Simon Albrecht since he won the time trial on road and track, and also the 500m on track (and he won all those events quite easily). However, in the final corner he was grabbed by an overenthusiastic Italian skater who was quickly disqualified (and he’ll have to miss the next race) but it was already too late and he rolled over the line in third throwing his arms in the air in exasperation. Incidentally, Raphael Planelles won the race, showing us that it really is possible to not only win the 500m and 20k elimination, but to do it on the same day. 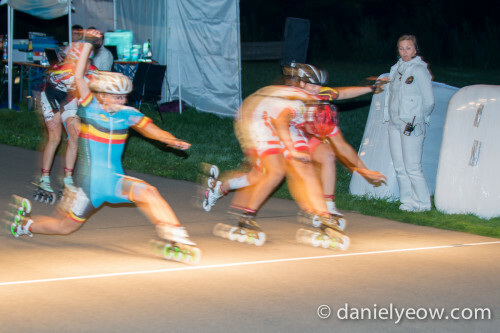 In the junior A ladies, Sandrine Tas of Belgium pulled out an amazing lunge at the line to take the victory ahead of Vanessa Bittner of Austria by a margin that couldn’t have been more than a centimeter. This is the second event on the road where Vanessa had to settle with the silver medal after being beaten by a ridiculously small margin. In the senior ladies, Italy’s Erika Zanetti somehow ended up in a final with three Germans, and was passed by two of them. In the senior mens, there were a surprising number of passes, and some very close side-by-side drag-racing down the straights, but it was Ioseba Fernandez of Spain (who also won the time trial(s)) who managed to take the win ahead of Gwendal Le Pivert of France (who won the 500m on track) and Michel Mulder who you’ll remember as the Olympic gold medalist in the 500m from Sochi back in February. The margin by which Sandrine beat Vanessa turned out to be three thousandths of a second – roughly the amount of time it takes for sound to travel one meter. Full results from the road competition can be found here. Don’t forget to check out the photo page.